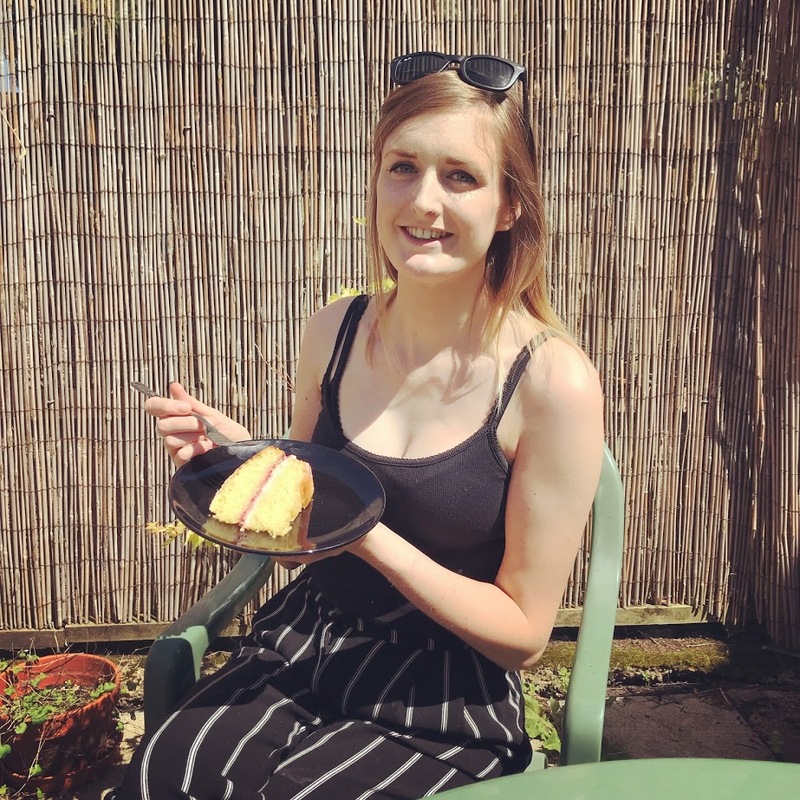 I’ve always been a huge fan of Italian food, particularly after visiting Rome back in 2016 where I couldn’t get enough of the fresh pasta, pizza slices and of course, the gelato! 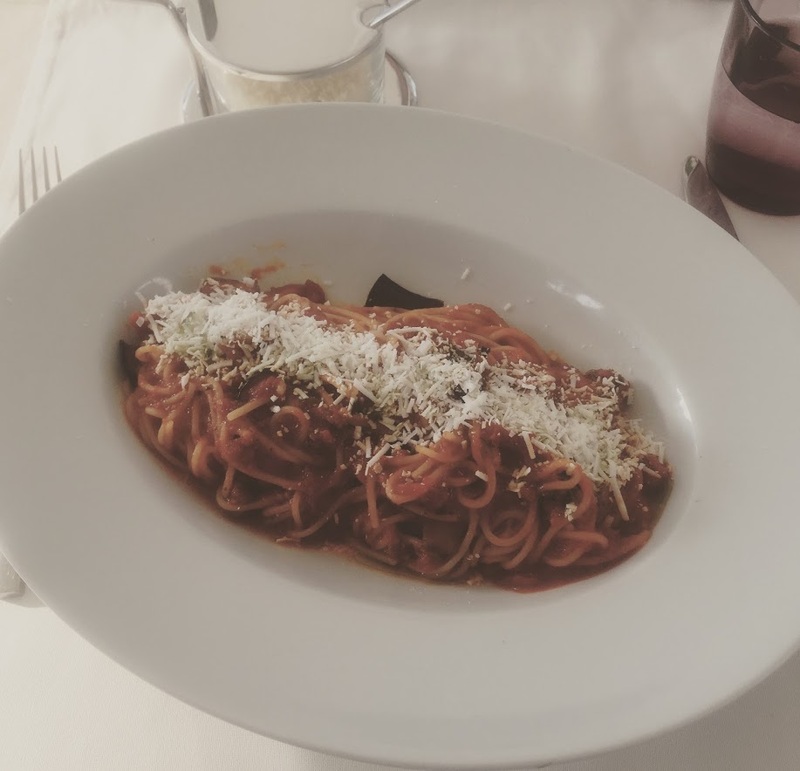 Ever since my visit, and turning low FODMAP I’ve frequently tried to perfect some of these delicious pasta dishes. 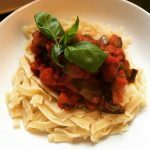 I’ve previously shared recipes for my Quorn ‘Meat’ Lasagne, Crab Spaghetti and Roasted Vegetable Lasagne, however one of my frequent favourites is the simple, yet incredibly tasty Pasta Alla Norma. I first had a low FODMAP version of this dish when on holiday in Santorini, where I had the incredible bowl below at an Italian Restaurant called Convivium, in the capital, Fira. 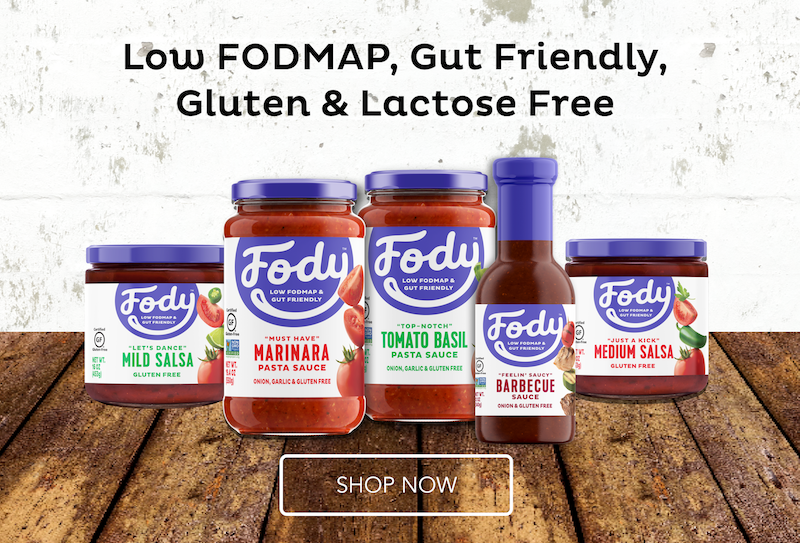 I’m not entirely convinced it was low FODMAP as I could taste garlic, but fortunately as I’d avoided garlic and onion for the rest of the holiday, I was fine. 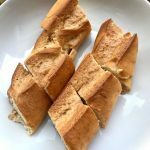 This was actually one of my first posts on my Instagram page, back in the early days of following the low FODMAP diet! 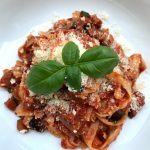 The Pasta Alla Norma recipe I’ve created is slightly different to the classic Italian recipe, as I have omitted the ricotta (too much lactose upsets my IBS! ), and I love parmesan instead. 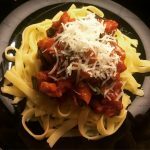 I’ve since made this pasta quite a few times, with either penne, spaghetti or fusilli but I think I like it best served with the new gluten free tagliatelle! I’d recommend Asda’s gluten free tagliatelle as others I’ve tried (Sainsbury’s) often breaks into smaller pieces. If you have a bit more time, you may wish to roast the aubergine first, however I quite like it cooked in the garlic oil and tomato sauce. Please note that the recommended serving of tomatoes is 92g as per the Monash app, and this recipe does exceed this, if you need to reduce the amount of tomatoes, replace with some vegetable stock or use fresh tomatoes instead (as these can be tolerated in larger portions). Heat the garlic oil in a large pan, and fry the aubergine for 3 minutes, or until softened. Add the plum tomatoes, tomato passata and chilli flakes, and season well. Cook on a low heat for around 5 minutes, stirring occasionally. Boil water and cook the tagliatelle, this usually takes around 11 minutes. Continue stirring the aubergine sauce, and just before you’re ready to serve, stir through the fresh basil. I’ve made this recipe quite a few times, please see below previous versions which have all featured on my Instagram (@lowfodmapinspiration). You can see the difference between Sainsbury’s tagliatelle (left) and Asda’s tagliatelle (right). 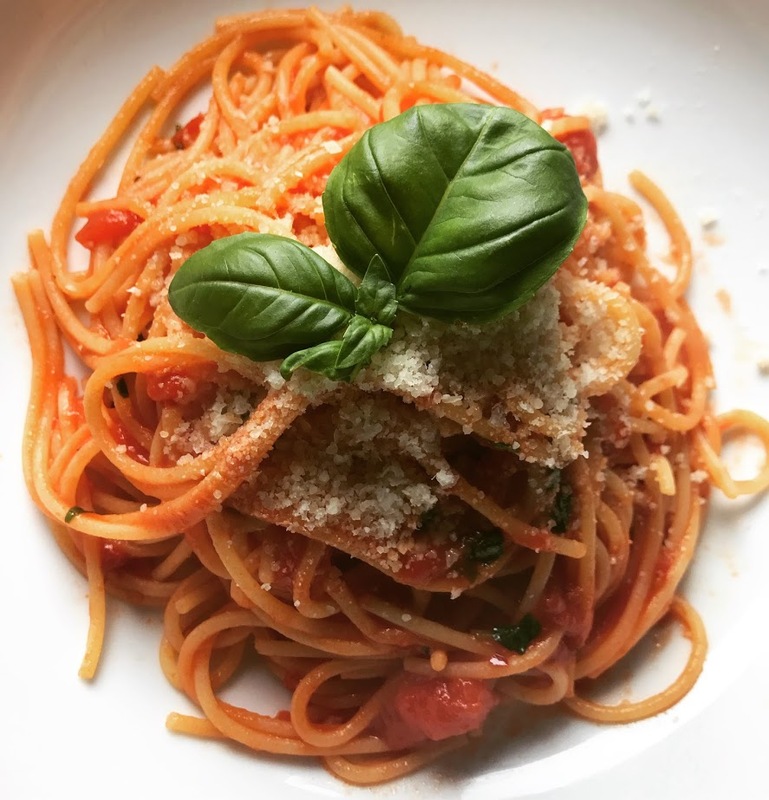 Alternatively, if you’re not a big fan of aubergine, or fancy something a little simpler, you can make the tomato and basil sauce (leaving out the aubergine) to make a delicious pasta pomodoro, below. 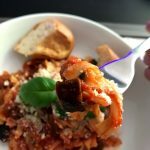 I hope you enjoy these Italian-inspired dishes as much as I do. Let me know if you give the recipes a try, and feel free share your favourite pasta dishes in the comments below…!